It has long been said that most sickness begins in the kitchen. Never have truer words been spoken. There are multiple reasons why this is the case ranging from improper food management to unhygienic cooking practices, from moldy refrigerators to contaminated countertops, from unhealthy food combinations to cooking old dead foods, from salmonella in the poultry products to E. coli in the beef products. With the introduction of the microwave oven into virtually every home in America, the kichen can now be considered a certified crime scene. Yes, they’re that bad … and much worse than most will ever believe, so accustimed are they to nuking their food on a daily basis. There’s a very good reason why they call it “NUKING”, yes?! Should we end this coaching session right here and now? We’d like to but so many are attached to this little EMR & Microwave outputting beast. Truly, the Microwave Oven has become a permanent fixture in virtually every kitchen in America. What an unmitigated health disaster this has created! Let’s take a look at the evidence. Not scientific just yet. The real evidence known as nuked food. How many times have you gone to a restaurant and been served a nuked baked potato? We don’t go to restaurants, and we don’t eat potatoes (they’re nightshades); nevertheless, in years past we have been out and about and have seen the thing they called a baked potato in the many fast ‘food’ restaurants and franchised ‘food’ chains. Would you eat that baked potato and if so, why would you do such a thing?!?! Can we end this discussion now or must we go on. Cancer Causing Effects — Creation of a ‘binding effect’ to radioactivity in the atmosphere, creation of cancer-causing agents within protein hydrolysate compounds, malfunctions within the lymphatic systems, higher percentage of cancerous cells within the blood serum, cancer-causing free radicals, stomach and intestinal cancerous growths, with a gradual breakdown of the function of the digestive and excretive systems. Decrease In Food Value — Microwave exposure caused significant decreases in the nutritive value of all foods researched. There was a decrease in bioavailability of B-complex vitamins, vitamin C, vitamin E, essential minerals and lipotropics in all foods, a loss of 60 to 90% of the vital energy field of all tested foods, and a marked acceleration of structural disintegration in all foods. Biological Effects of Exposure — Breakdown of the human “life-energy field,” degeneration and circuit breakdowns within the front portion of the brain where thought and higher functions reside, loss of balance, long term cumulative loss of vital energy and long-lasting residual effects. 1. Continually eating food processed from a microwave oven causes long term, permanent, brain damage by ‘shorting out” electrical impulses in the brain (de-polarizing or de-magnetizing the brain tissue). 2. The human body cannot metabolize (breakdown) the unknown by-products created in microwaved food. 7. 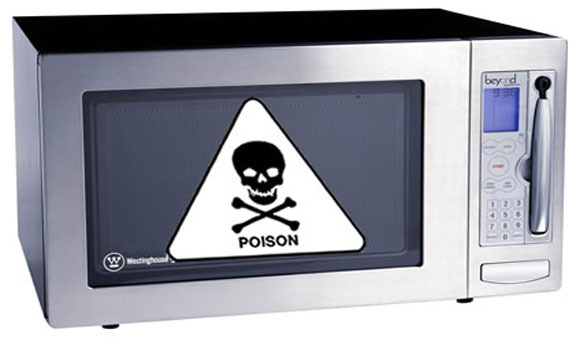 Microwaved foods cause stomach and intestinal cancerous growths (tumors). This may explain the rapid increased rate of colon cancer in America. 9. Continual ingestion of microwaved food causes immune system deficiencies through lymph gland and serum alterations. Clearly the primary explanation for so many people refusing to listen to the voice of reason or the gut feeling of common sense concerning this extremely serious health matter, is the irresistible convenience that comes with using such a beast … 3 times per day, every day of the week, every month of the year, for life. Now that’s a life sentence, if ever we have seen one meted out to oneself! Is that you? Hopefully not, because the unintended consequences, collateral damage and toxic side effects of microwave usage completely justify its exile to the global trash heap. • Blood hemoglobin levels decreased significantly after ingesting microwaved foods, both total levels and the amount contained in each red blood cell. • White blood cell levels tended to increase for no other reason than foods were microwaved. • Microwaves altered protein molecules. • LDL cholesterol (the ‘bad’ type) increased relative to HDL cholesterol (the ‘good’ type). “Do not heat food containing fat in a microwave using plastic containers because the combination of fat, high heat and plastics releases dioxins and other toxins into the food and ultimately into your cells. Dioxins are carcinogens and highly toxic. After researchers studied several commercial plastic containers, compounds such as methylbenzene, ethylbenzene, 1-octene, xylene, styrene and 1,4-dichlorobenzene were found in all of them. 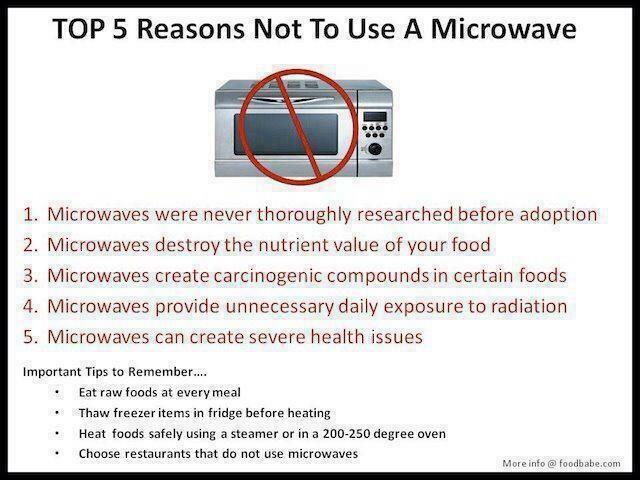 Also, the increased output power of modern microwave ovens can cause overheating. Although cooking of raw foods in a microwave targets an acceptable end product for touch, taste and smell, the process does not address the microbiological safety of the cooked food. Microwave ovens from various commercial suppliers were used to cook naturally contaminated whole raw broiler and roaster chickens according to manufacturers’ instructions. Many of the roasters yielded visible Listeria bacteria after microwave cooking. One of the ways to decrease exposure to harmful chemicals, and all the scientists agree, is don’t microwave in plastic. Can you believe that so many cavalierly microwave (heat up) their foods and beverages in plastic containers?! As though plastic doesn’t melt or get so hot that it allows for migration of petroleum-based derivatives into the food or beverage contents??? We think that we have provided enough highly credible research for anyone reading this to dispose of their microwave. If you choose to keep it in operation, it may very well significantly contribute to the degradation of your health at the cellular level, tissue level, organ level as well as systemically. We strongly believe that the rapid increase of so much chronic degenerative disease can be partially attributed to the frequent use of these DANGEROUS devices. They have become so ubiquitous that their detrimental health effects are surely being felt far and wide. The problem – as always – is that the scientific community has avoided this area of research like the plague. Undertaking such research studies would be the best way to demonstrate the direct correlation between microwave use and various medical makers and health stats. Whereas GreenMedInfo has provided these excellent research studies, the dearth of such scientific research is clearly due to the many and diverse vested interests who ensure that few will likely ever be undertaken … to the great detriment of both individual and collective health. 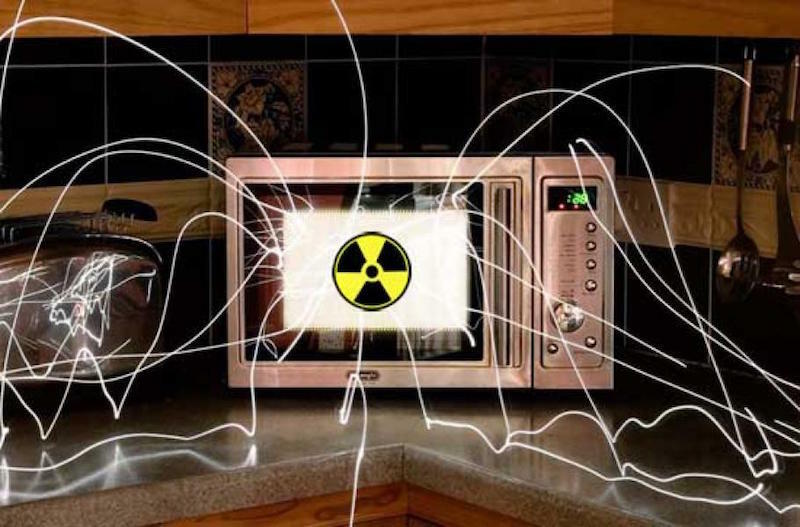 In the meantime, you, the cook, and you, the eater, can easily avoid the radiation from the device, as well as the negative consequences of eating microwaved food. We have managed to do so for well over 25 years with virtually no inconvenience. However, we’re not at all shy about asking the waitress to ensure that none of our food will be nuked on that rare occasion that we find ourselves at a restaurant. You can do the same, if you believe what you’ve read here today. You know, we dealt very little with the EMR and microwave effects in the ambient living environment when these little beasts are turned on and humming. This is likewise a HUGE issue which poses it’s own list of serious health concerns as presented by many researchers. How many times have you read that those with pacemakers should not be around microwaves? Given what most of us now know about electro-pollution and the many long term effects of stray voltage, ‘normal’ emr output and 2-way emr overload, do we really need to go there? For those uninitiated into this realm, we will take this up in our next health blog on microwave ovens. Water, by it’s very nature, is extremely impressionable. It possesses different qualities, some of which are far too subtle to measure, but nevertheless important for health reasons. When water is microwaved, it is profoundly and fundamentally altered on an energetic level which produces chaos in its energy field. How will this translate when nuked tea and coffee water is regularly drank over years? We don’t know. And that’s the problem, we just don’t know. You might peruse the following article written by our good friends at Natural Society for some additional understanding. The Health Coach once worked for a company in Atlanta, GA in the mid-90s. For almost two straight years the owner of the firm was seen to microwave his lunch (a different frozen dinner every day) every afternoon, without exception. Immediately after eating the ‘meal’, he would go into a coughing fit, each and every day, without exception. Some of us would sit there within earshot listening to the terrible discomfort which he suffered, as endless coughing sounds could be heard through his office door. This happened 5 days a week and gave us much to ponder about what might be causing such an uncontrollable fit of coughing. Needless to say, those of us who were health conscious never went near that microwave. He did pass away shortly thereafter as a result of heart disease, diabetes and other chronic ailments.